Perhaps its time for some Poulet Marengo, a la Gilbert? lol! You poor thing. I'd be tempted to strangle the pretty thing. Gilbert is the perfect name for him! LOL! I think that is the perfect name for the rooster! From our flock we have one hen and one over-zealous rooster! I understand this post entirely!! He should definitely not crow right in front of anyone's room. At least the name you are considering isn't Soup! I don't know who started the FALSE saying that roosters crow at sun rise! Ours start at about 3 am too..but they are farther from the house thankfully! Gilbert would be the perfect name for that annoying loudmouth of a rooster! Don't you just want to kill it every morning? Oh, that cracked me up--Gilbert the Rooster! Ha, this puts a damper on the dream of country living that many of us share. lol... I know it isn't funny but that is a really cute post. My Hubs would take care of him using lead. Pet or not, he would be in our soup pot the next day. 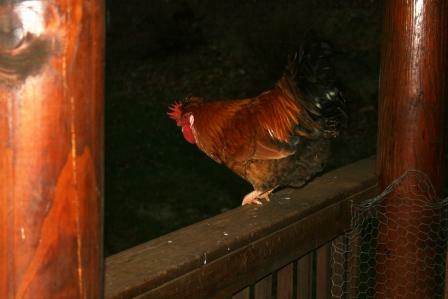 Our neighbors have roosters. (They claim that they aren't for fighting but it sure is suspicious to have nothing but roosters....) Anyway, those roosters crow all. The. Time! Haaa Gilbert would be a PERFECT name for an annoying rooster! What an ornery lil thing. Every rooster I had was names Shooster...Shooster the rooster. While I encouraged them to come to the house and crow first thing in the morning TJ wasn't as thrilled with it as I was...lol. We were usually up by 3 am anyhow, and I enjoyed hearing him first thing in the morning. Beautiful rooster! Hmmm, some broiled chicken (rooster) with lemon pepper and asparagus sounds really good now. With new potatoes. He better watch his p's and q's!! Haha! That pesky rooster needs to take a hike. Sleep is a top priority! Love the connection to that other annoying critter. LOL, I think the name suits him! He's a pretty rooster though! 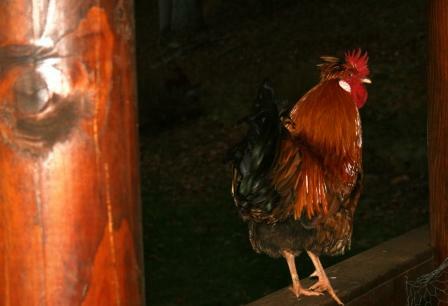 Is he your only rooster? You don't need them for eggs but you need him for babies. Gilbert is a fabulous name! That noise would bug me too. Many a rooster is minus a head for that very thing. If I sound harsh it's because I have been there. This conversation was delightfully funny though. Too funny! Is this what I have to look forward to? Hope to get my first chickens this spring. 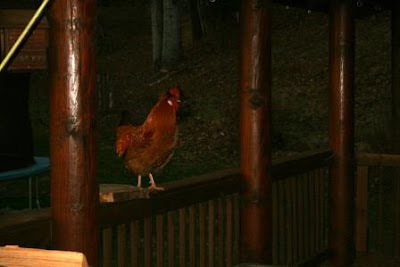 I wonder if roosters have heard the old saying "A chicken in every pot"
LOL, oh no!! You're right on the comparison of the rooster and Gilbert! I never did like him...haha. 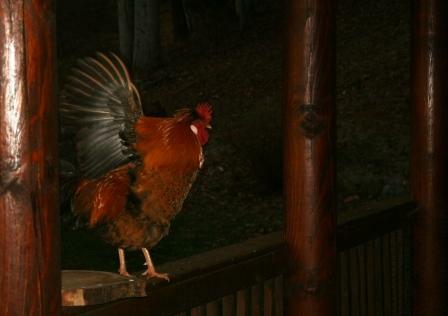 We have a silly rooster too! Granted, I don't think your Gilbert will make a mint off his annoying voice. Stopping by from the Mom Loop! As always, you crack me up! We have a rooster like that around here... but to me it's the neighbors goats that drive me nuts. I always think one of my kids is crying! Already following you through GFC. Oh my goodness, you are much kinder than I would be. I would likely consider a rooster relocation program. 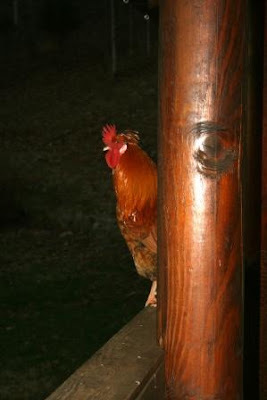 So funny (for those of us not hearing the rooster doing his thing so early in the morning)! !